Prestigio recently introduced three new products as a kick-off for its latest lineup of iPod speakers/docking stations. These stylish and convenient gadgets provide a direct access to your digital music, enhanced sound quality, and power source for you iPod. 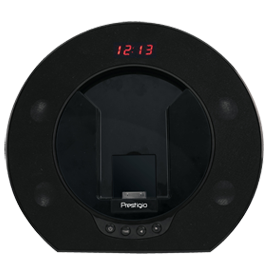 Three models of iPod speakers/docking stations are being added to Prestigio’s portfcor. The new speakers all feature five equalizer modes for sound that meets your preference, as well as a built-in stereo radio and digital alarm clock. They can also connect to other portable audio devices such as MP3 players, CD players, and laptops. A remote control is also included for your convenience, as well as a warranty of two years. They are compatible with all iPods. Enjoy your favorite music directly from your iPod or iPhone with the Prestigio PIS1, a speaker/docking station which provides dynamic and powerful sound while recharging your device. It has easy to use touch sensitive controls and a sleek, elegant housing with an aluminum look that will add a modern touch to any décor. The Prestigio PIS2s glossy black look will complement any interior, while its blue ambient light creates a relaxing atmosphere. The PIS2 features easy to use touch sensitive controls to complete the stylish look. The Prestigio PIS3 features a unique rotating center-part allowing you to position the iPod screen vertically or horizontally. The Prestigio brand offers an exclusive combination of elegance and sophistication, high product quality, advanced technology and state-of-the-art design. We aim to provide an enhanced quality of life with affordable luxury products to those who enjoy a cosmopolitan lifestyle. Our portfolio includes IT-related consumer electronics and computer peripherals such as external HDDs, USB flash drives, notebook bags, desktop PC, GPS devices, and more.